Babylon Micro-Farms’ cabinet-sized indoor farms can grow a variety of greens, herbs, edible flowers, fruits, and vegetables. The contraptions may be high tech, but they’re purposefully easy to use: Plug a pre-seeded tray into one of the beds, and technology does the rest. Soon, you might not need a green thumb to farm continually fresh greens at home. For that matter, you might not need a garden, at least not in the traditional sense. For that, you can thank Alexander Olesen and Graham Smith, two recent UVA graduates who have developed a series of hydroponic micro-farms that are already in use commercially here in Charlottesville. Babylon Micro-Farms sprung from a challenge UVA professor Bevin Etienne posed in his social entrepreneurship class, in which students were asked to develop a product to help refugees, something with high impact and a low price tag. Something that people would be able to download an open-source design for and make on their own. In the research process, Olesen says he got “very hooked” on the idea of hydroponics—a method of growing plants without soil—and how it has the potential to use significantly less water than conventional agriculture and grow crops twice as fast. Olesen quickly realized that there was nothing available to the average consumer interested in trying this game-changing way of growing food. Hydroponics systems are largely limited to massive consumer operations, and worse still, inaccessible to people in developing countries and communities who could benefit greatly from such a product. The initial micro-farm prototype—for which Olesen and Smith teamed up with Hack Cville—turned out to be low-tech and the size of a small car, and the entrepreneurs realized that if a community doesn’t have access to food, it’s not likely to have access to pH monitors, nutrients, and everything necessary to make the hydroponics system work, either. 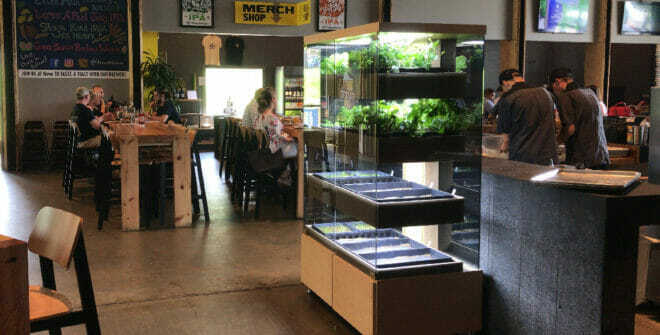 “Everything we’ve done since is figure out a way that we can make a platform that allows anyone to engage in hydroponic farming regardless of their background or expertise,” says Will Graham, Babylon Micro-Farms’ director of marketing and sales. Olesen, who graduated this past spring, spent the summer with Darden School of Business’ iLab, refining the product and securing grants from the iLab and UVA Student Council’s Green Initiatives Funding Tomorrow program, as well as $600,000 from angel investors in order to grow the company from its two founding members to an eight-person operation with a Downtown Mall office. To better serve the customers the company has in mind, it has developed the technology to make the mini farms run themselves. “It’s plug-and-play,” says Graham—at least for the consumer. Babylon Micro-Farms provides pre-seeded trays to be placed into the farms, which are big, clear cabinets with four levels of shelving. Each shelf holds beds for seed trays, and each bed is lit from above with special bulbs that give crops a continually perfect sunny day. Once the pre-seeded trays are in the cabinet-farm, technology does the rest of the work. “In this controlled environment, you’re giving [the crops] the concentrated nutrient profile they’d be taking from the ground, but in a solution form, and with optimized lighting” and more, says Graham. The conditions inside the cabinet are all monitored and regulated by the system, which assesses, among other things, the pH (acidity) of the water/nutrient solution, carbon dioxide levels, air temperature, and humidity, and adjusts accordingly, depending on what’s growing—micro-greens, leafy greens, herbs, edible flowers, fruits, or vegetables. The system will even stagger harvests so the crops ripen in waves, ensuring dozens of heads of lettuce won’t ripen at once, but a few at a time, just as they’d be eaten. Babylon Micro-Farms is also working on a self-sufficient hydroponic farm at Boar’s Head’s Trout House, one that will provide salad greens, herbs, peppers, and tomatoes, all “exclusive heirloom varieties from the Thomas Jefferson Center for Historic Plants” at Monticello, to help provide food for the resort, says Graham. They’ll be installing a micro farm in the new Cava location on Emmet Street in October as well. All of this condensed growth in three short years is as impressive as the accelerated growth seen in Babylon Micro-Farms’ machines, says Olesen. But the company hasn’t forgotten its roots. Babylon Micro-Farms has teamed with Etienne’s climate resilience lab at UVA, working to develop concepts for low-cost and portable systems, such as a fold-out farm that collapses to the size of a rain barrel and can be sent to areas of food scarcity for disaster relief; places ravaged by increasingly disastrous hurricanes, for instance. They’ll test the system with UVA’s Morven Kitchen Garden as they work on pilot projects on Caribbean islands devastated by last year’s Hurricane Irma. And for the eager at-home farmer here in Charlottesville? Those systems could be available for order as soon as the end of this year, with a spring delivery, for an estimated cost of $3,500.